Nox Factor Review - (Learn the truth) Does It Really Work? Should you buy Nox Factor? Nox Factor is a supplement marketed as a testosterone booster that supposedly helps enhance your physical appearance and your physical performance. The company behind this supplement claims this product to be 100% natural. It is manufactured by a US-based company called NOX Factor. The company has made quite a few claims about Nox Factor benefits. The supplement is said to help increase stamina and strength in the gym and in the bedroom. The significant ingredients in this supplement are Beetroot extract, Vitamin C, B vitamins, and L-Arginine HCL. L-arginine HCL is an artificially manufactured form of arginine. This makes the amino acid more palatable and easier to absorb in the body. Various studies proven that it can increase blood circulation, regulate blood pressure, and boost the immune system. The expanded flow of oxygen and nutrients gives the user stronger muscles and quicker recovery of muscles and tissues. B Vitamins, like Niacin, can help combat pain, stress and muscle stiffness. They also help the user develop endurance and strengthen the central nervous system. Ingredients like Beetroot extract help to improve exercise quality, support eye health, and improve sexual desire. It also acts as a potent antioxidant. This supplement is quite expensive. A bottle consisting of a month’s supply is available at the price of $89.95. The company offers a 14-day trial period. The trial period begins immediately after you order the product, and it takes about 7 days to ship, you will only have about 7 days to try it out before you decide to cancel or allow the automatic payment. There isn’t much information about the dosage. Some of the user reviews suggest taking two capsules a day, other consumers recommend three capsules per day. We suggest you start with a lower amount and gradually build your tolerance. There aren’t many reviews on this supplement, so we only have the manufacturer’s word regarding its efficacy. 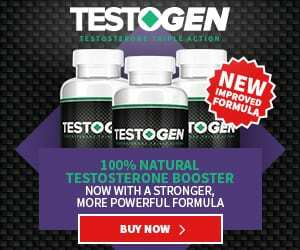 Although the company claims this supplement to be a testosterone booster, we didn’t find any ingredient that can effectively increase testosterone levels. Frankly, there are too many uncertainties surrounding this supplement. We feel you can find much better supplements on the market, especially considering the price tag. Just make sure the supplement you choose has been clinically tested and backed by reliable science. Also look for customer reviews, as they play a vital role in testing the validity of the manufacturer’s claims.